Those morph into becoming a purposeful desire in your life. 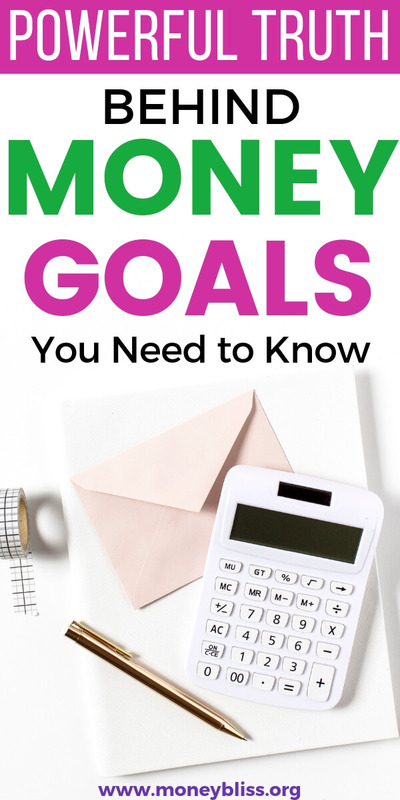 Money goals are the backbone to making progress towards financial milestones. At the end of the day, you have two ways to go through life. Be Intentional with the money you have been blessed with. Be Haphazard with your money and not have a direction. In the end, the choice is ultimately yours. The freedom to make your own decision. However, if you are reading this, then I expect that you are looking a little more deeply at life and what you want to accomplish during your lifetime. In this post, we will uncover the purpose, the importance, and how to make money goals. As well, as the benefit of a money vision board to accomplish your money goals. Simply put, the definition of money goals are the goals for your money. 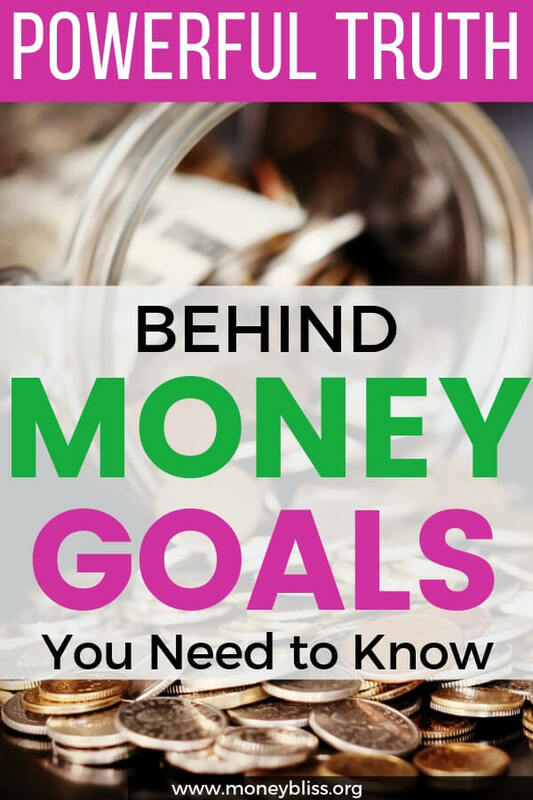 Since that is pretty top level and not extremely helpful, let's dig a little deeper into the purpose of money goals. Money goals are specific actionable steps to take towards a bigger money vision. 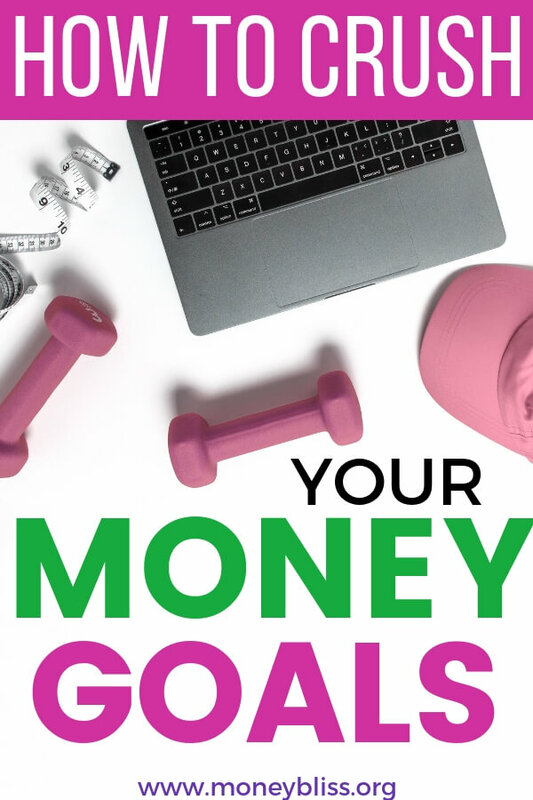 The areas you want your money to go towards that would be the start of creating money goals. Think about where you want to be in life? How do finances correlate to your life vision? Then, dig in deeper, think where you want to be – financially – in 1 year, 3 years, 5 years, 10 or even 20 years. What financial milestones do you want to accomplish? Big and small financial goals are important. They are a stepping stone to financial security. At Money Bliss, we laid out the Money Bliss Steps to Financial Freedom in order. They are developed to create a strong foundation with money. One that won't be washed away when the next storm hits. Money goals make sure you create the foundation to stand upon to reach the next financial milestone. If you have been around Money Bliss long enough, you know that I didn't always handle money in the best way. Back in time, I had a spending problem. The biggest benefit of money goals is to keep you financially on track. It is one thing to make a money goal, set it aside, and not to put action towards your financial goal. It is a completely different to start acting on your money goal immediately and start seeing instant progress. With money and life, you have the freedom to choose how you plan to spend, save, and give your money. By utilizing money goals, you are choosing what is important in your life. More than likely, it will be different than the person sitting next to you and that is okay. You want to line up your spending to what make financial sense to you and your wealth vision board. Another importance of money goals is they provide the framework to be successful. Move from one step to the next. In order, to reach financial independence and then financial freedom. Aren't we taught that we need to be careful of the love of money? More than likely, yes, but as with anything you must establish boundaries for reaching your money goals. For example, the money goals were established so to leave a lucrative career to something you love or with less stress – like a barista or school driver. Maybe you wanted to check out the FIRE movement. The love of money only occurs when you put money before anything else in your life. So, as you move forward in creating your financial goals and wealth vision board, remember your priorities in life and what matters more than money. Making a financial goal is awesome. The key is putting an action plan in place to reach the money goal. And the most important step, actually take steps and make progress towards your personal and financial goals. First, you must uncover what you want out of life. What is the big overarching vision for your life? Once you have a solid idea, then it is filling out your money goals to align with your big vision. Your money goals must match up to what you want out of life!! For instance, if your big vision is the desire to retire early, but have very little saved for retirement. Then, a money goal is to open a retirement account and start contributing a percentage of your income. Key Tactic: When making your money goals, make sure they are measurable. Specifically give them a time frame and an amount or percentage. Those indicators will help you move through your money goals faster to reach your big life vision. A plan is essential in order to reach financial goals. No progress can be made with a solid action plan in place. Personally, this one (quick read) book has completely changed how I make, create, and execute plans. We have used it in many areas in our lives (even my kids tested it out and found success). It has been a game changer in my life and I can't stop recommending the book because the message is powerful. Pick up your copy here. Also, make sure to have mini goals along the way. It will help to keep motivation at a high! For instance, the goal is to pay off $150,000 in debt. That is a lofty amount of money to repay and typically will take a few years to accomplish. So, set mini milestones along the pay. You can do this in two ways. The first way is by the type of debt and eliminating those. The second way is by total amounts paid off. Paying off $75K in debt needs to be recognized for a persistent effort in striving to your money goal – pay off debt. By telling someone else, now the accountability train has started. An accountability partner is someone who will keep you accountable to your money goals, help you work through road bumps along the way, and keep you motivated when things get hard. This person could be a spouse, a friend, a family member. You need a trusted confidant. The downfall caveat is these accountability partners identified may not be the best cheerleaders. Many times, out of jealousy, they will try and take you down from reaching money goals and tell you they are impossible to reach. Stop the naysayers! Bonus Tip: Schedule a standing accountability checkup meeting. That way you know each week on Sunday afternoon that you will have to discuss the progress towards your money goals. Pick a day and time that work for you and be consistent! Time to bring out the pencil and paper. Research studies have proven you are more likely to achieve a goal by physically writing it out than not writing it out. Even if you type it out, spend time to actually write it out in your own handwriting. Post your money goals where ever you can see them! If overspending is an issue, write your money goal and put it so it is the first thing you see in your wallet. Next, make sure to track your progress. That way you can see if your actions (or lack or actions) are helping to reach your money goals. Remember, tracking progress isn't about perfection every single time. It is about making progress towards your money goals. According to my favorite highly recommend book on creating a plan, you need to reach achieve your tactics a minimum of 85% of the time to have success in the time frame allocated. In the resource library, there are plenty of free printables to help track your progress. During your accountability time, evaluate to make sure the current money goal you are striving for still lines up with your vision. If it doesn't line up, then start over with a money goal that aligns with your money vision. If it does line up, keep up the persistence to the money goal. Evaluation is a key aspect of successfully meeting any financial goal. 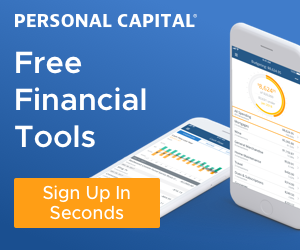 Time to create new money goals! This is probably my favorite step on how to achieve money goals! The reason why is simple. By working through the previous steps, I have now proven that I can truly reach my money goals and find success. So, now it is time to repeat the process with new money goals. SO FUN! For as long as I can remember, I loved quotes. Honestly, it was more of an obsession. A quote is a powerful message of motivation. The power of the money vision board is just that powerful. 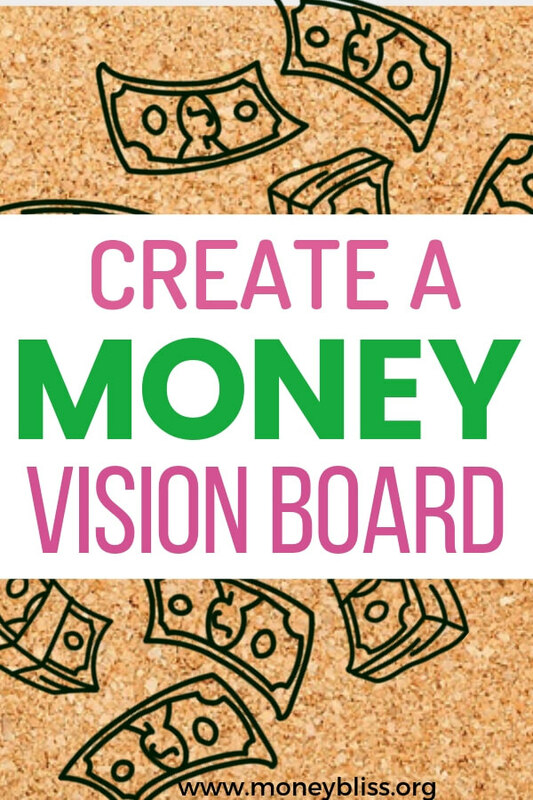 A money vision board is a visual way to actually see and continually focus on money goals. It is a simple tool that represents what you want out of your life. The simple purpose of a vision board is to help guide you on a daily basis when making decisions. When the going gets hard, your vision board is there to keep your motivations high and keep you going. That is why it is important and beneficial to put your vision board in a place you can see it. Or even in multiple places. Deciding on a timeline to a vision board is crucial. But, to be truly successful, you need to have two vision boards at once to make sure you are purposefully on track to meet your money goals. The vision board timeline is a big lifetime picture and a short-term specific goal. When it comes to money goals, I highly recommend to have a global, overarching vision board for your life. THE BIG VISION! This big picture is your path to follow. The vision board is a way to know if you are on track or if you have strayed. Sometimes, a life event will throw everything upside down and then, you must pick up the pieces to make a new and beautiful vision board. And that is okay. You will be stronger in the end. Even though, at the time, the brokenness is too sharp to pick up. Those edges will soften and the purpose of your new path will become stronger. Then, the next vision board is specific to what you want to accomplish next in your life. For instance, when we paid off $53K of debt in one year, our debt free vision board was simple. The dollar amount to be paid off. The debt payment number because it would be used for something else. Then, the last piece was a picture of a beach. A family vacation to the beach (paid in cash) would be our reward for the sacrifices to make it happen. Big Vision – What is yours? What is going on your money vision board? A good place to start when creating a specific financial vision board is with the Money Bliss Steps to Financial Freedom.